Lorret de Mar in the Costa Brava is a tourist center of the autonomous community of Catalonia, not far from Barcelona, Spain. Loved by young people looking for fun, but also by those looking for a holiday on the coast asking for something exclusive, Lorret de Mar is a seaside town, located in northern Spain, which was shaped in accordance with and depending on the sea and what it offers and can be shared. It was 1950 when the town was literally discovered by the Spaniards in search of a stylish place to stay especially in winter: the pioneers were especially good families from Barcelona. Its history, as you can see, is not ancient: modernity characterizes this dynamic city though, moving from the bustle of the town, you can see an ancient tower, a symbol of the area as early as 1100 AD. Lloret de Mar, defined as 'kind paradise' by the poet Josep Carner, is not large, it has in fact about 40 000 inhabitants, and perhaps because of this it has been chosen, instead of large cities, as the ideal location for the movida. Inexpensive enough to be ideal also for those visiting Barcelona, Lorret de Mar betts everything on entertainment related to beach life. The clean and well maintained beaches - including the famous Lido Lorret – are embraced by an infinite number of restaurants, bars, fast-food restaurants, discos (divided by musical or aesthetic genre of its regulars). For those in search of beauty and not only fun, the route includes a visit to the botanical garden Marimurtra, an area overlooking the sea rich in vegetation, with its 4,000 species of plants, and which changes every two weeks for the pleasure of visitors. Walkers will find fascinating the Cami de Ronda walk that follows the path of the coast, and reaches Sant Joan Castle. Other walks are inland, and are immersed in the dense vegetation of the area. Located a short distance from the beach and 1 km from Lloret de Mar, Costa Encantada Aparthotel is particularly suitable for families and offers its guests a bar, disco, three swimming pools and restaurant. 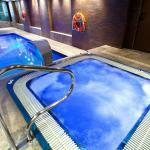 Marsol Hotel is located a few steps away from the sandy beach on the lively promenade of Lloret de Mar, Costa Brava. The hotel offers comfortable air-conditioned and soundproofed rooms with all modern comforts. The Acacias boasts a unique setting on the seafront of the picturesque town of Lloret De Mar. 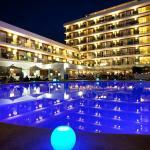 The hotel is an ideal solution for those who want to enjoy the beauties of Costa Brava and its lively nightlife.